If you have money, you stop thinking about what all you spend it on. Brand name clothing purchases are of no big consequence even if they’re hundreds or thousands of dollars, because there’s always more in the bank. Of course, not everyone gets to live such a lush life, but there will always be a market for high-priced items that have minimal difference from their cheaper counterparts. 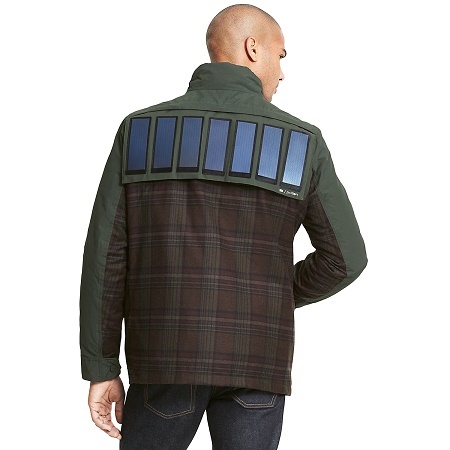 If you’re a high-roller who’s a fan of Tommy Hilfiger and are currently in the market for a backup battery for your phone, then you’re going to love the Solar Panel Jacket. This is a winter coat made of wool, nylon, and polyamide with a detachable hood and a removable battery that’s charged by solar panels on the back. You can only spot-clean this, which means your life basically needs to be as dirt and grime-free as possible to maintain its state. This jacket is nothing to sneeze at with a price tag of $599, so you certainly won’t see this on the average Joe. There are varying sizes and it is available for men or women. Seeing that this is meant for winter when the sun is not exactly prevalent, this won’t be the most helpful of purchases. It would probably be better to pick any of the battery pack options we’ve seen in the past that would be far cheaper and wouldn’t need to rely on the sun. Three years ago this would have been the perfect April fools joke. Is it just me, or does this look as stupid as Google Glass?